The objective of this series is to promote theory and research in the increasingly growing area of occupational stress, health and well being, and in the process, to bring together and showcase the work of the best researchers and theorists who contribute to this area. As you know, questions of work stress span many disciplines and many specialized journals. Our goal is to provide a multidisciplinary and international collection that gives a thorough and critical assessment of knowledge, and major gaps in knowledge, on occupational stress and well being. 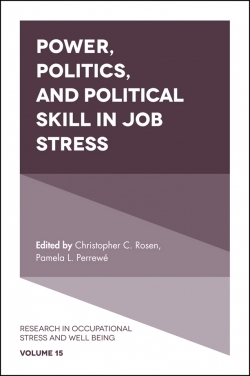 Research in Occupational Stress and Well Being is focused on power, politics and influence. It has been widely accepted that power, politics and influence are pervasive within most social entities, including work organizations. However, research on the role of social influence in the stress process is still needed. This volume will focus on the connections between social influence processes, broadly defined (e.g., power, politics, political skill and influence), and employee stress, health, and well-being.